Apple has rolled out iOS 8.1.3 for iPhone, iPod touch and iPad devices, after weeks of extensive testing. 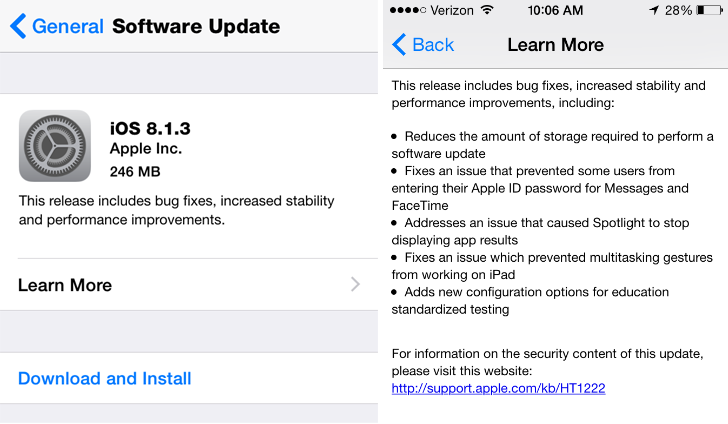 The iOS 8.1.3 update contains bug fixes, stability enhancements and performance improvements. Among the new features, it reduces the amount of storage space required to perform a software update. The update can be downloaded by going to Settings > General > Software Update. The download size of iOS 8.1.3 is 246MB. Apple users with 8GB and 16GB devices will definitely appreciate the reduced storage requirements for updating to iOS 8. In addition to bug fixes, iOS 8.1.3 also includes a number of security improvements which can be viewed in detail on Apple's security page for the update. Apple is also preparing to release OS X Yosemite 10.10.2 beta update, which contains a patch for the Thunderstrike vulnerability that allows malware to be injected into Macs via the Thunderbolt port.